is constant in time. Here, is actually the planet's total energy per unit mass, and . This is the equation of a plane that passes through the origin, and whose normal is parallel to . Because is a constant vector, it always points in the same direction. We, therefore, conclude that the orbit of our planet is two-dimensional; that is, it is confined to some fixed plane that passes through the origin. Without loss of generality, we can let this plane coincide with the - plane. 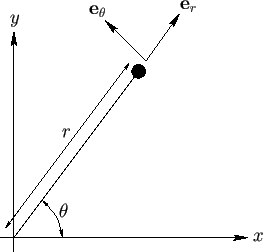 Figure 4.1: Plane polar coordinates.